Finding keywords for your website is easier than you might think. However, ranking in search engines for those terms is where the work and patience comes in. It can takes years of work to generate serious competition for keywords. But you may not even notice how much time has gone by because you have plenty of work to do in the meantime. If you're ready to get started, let's find out how to choose valuable keywords to target on your site. Keyword strategy, like SEO itself, is a deep topic. We can introduce you to the basics, but this is only a starting point. Take it slow and read a little bit each day. Soon you'll be an expert. Keyword optimization falls under the broader category of SEO (Search Engine Optimization). But more and more, content has become a bigger part of the overall SEO strategy of a site. In the old days, SEOs used to bloat a page with keywords so they could fool ranking systems. Search engines caught on though, and now such a thing could get you penalized and cause your site to drop quickly from the top of the search engine rankings. All of these various media can represent your keywords in creative ways. This way, your readers and viewers won't notice the keywords (but the search engines will). When it comes time to choose your keywords you can start with the easiest one that best describes what your site is about, for example: italian restaurant. Now, depending on the number of high-quality Italian restaurants in your community, this might be the toughest keyword to rank for because the competition will be high. So what you'll need to do now is use a keyword planning tool to help find related keywords you can target as well. Once you've chosen your related keywords, you can place on a spreadsheet to track how you're representing them across your media channels. Now that you've selected a list of keywords it's time to start targeting them. This is where the BoldGrid SEO plugin makes it really easy. 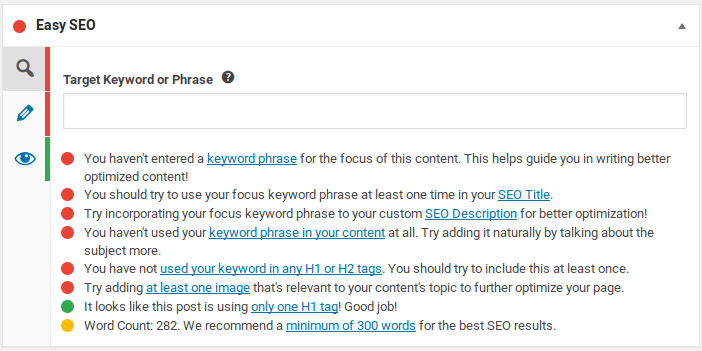 The BoldGrid SEO plugin helps you integrate keywords nicely into your content. Notice when you're working on a page or post, if you scroll down, you'll see the SEO toolbox. All you need to do now is input your keyword phrases into the text field. The Easy SEO tools will provide insights about how you're using the keyword phrase in your content and things you can do to increase the SEO quality of the page. Should guidelines are based on current SEO trends and might change over that time. That's why it's always a good idea to go through your site and take inventory of your SEO quality on new and old pages and posts. And, as always, if you have any questions or comments, please leave them below and we'll do our best to answer them.